Quinoa has well and truly caught on, hasn’t it? It’s in every supermarket, on the menu at every cafe; it’s even in chocolate. I started cooking quinoa several years ago when it was still a food for fringe-dwellers, but apart from trying two or three recipes, I didn’t really know what to do with it. Although quinoa has a nutty flavour and interesting texture, I was more comfortable with the flavour and versatility of my staple grain, brown rice. Despite the impressive nutritional profile of quinoa, most packets I bought were dipped into once or twice before gathering dust at the back of the pantry. I have an annoying tendency to do this, to enthusiastically purchase interesting new ingredients then forget about them until they are past their expiry date. Dried seaweed, anchovies, buckwheat flour, raspberry vinegar – all purchases made in the spirit of experimentation that languished and eventually mouldered. I’ve realised that if I can’t find several ways to cook such ingredients easily, quickly, without a recipe (ideally), and still taste delicious, then I’m better off just ordering them at restaurants. It is true that I have some way to go to conquer my wasteful ways, but happily, quinoa at least has reached the status of “staple food”. Two things prompted this. First, I discovered that that my beloved brown rice is most likely laced with arsenic so I was motivated to find a replacement. (How disappointing then that I subsequently learned that some activists are calling a halt to quinoa consumption amidst fears that its production contributes to malnutrition in Bolivia. Which is worse: poisoning myself, or starving others? Now I look for Australian quinoa, just to be safe.) The second happening was that Penny came for dinner. Penny from NZ happened to be in Brisbane for a few days, happened to have a spare evening, happened to want to spend it with us, and we happened to be free that night. With no time to plan, I literally stopped at the store on the way home from work to pick up a few vegetables. While we sipped wine and chatted, I constructed a quinoa and roasted vegetable salad which turned out to be pretty good. Since then I’ve made it several times, and it just keeps getting better. It’s best made with red quinoa, great eaten alone, and divine with cold roast chicken. It’s on the menu, again, for Saturday night. My new found love of quinoa has reminded me of all those other recipes that I tried once or twice, including Lucy’s Quinoa and Millet Pilaf, Heidi’s Quinoa Patties and her custardy Quinoa Cornbread, and Sophie’s Quinoa Pancakes. Maybe it’s time to give these a whirl again. First prepare the vegetables for roasting. 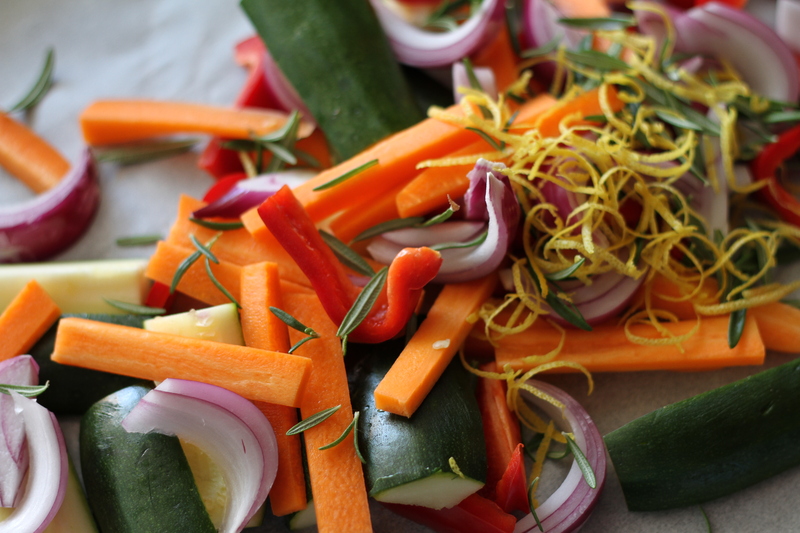 Preheat the oven to 180 C. Cut the vegetables, as you like, into pieces that will roast evenly together in 20-30 minutes. For me this means dicing the softer vegetables (like eggplant, courgette and capsicum) into 2cm cubes, slicing the onion into 1cm wedges, and cutting the remaining hard vegetables (such as carrot) into thin batons. 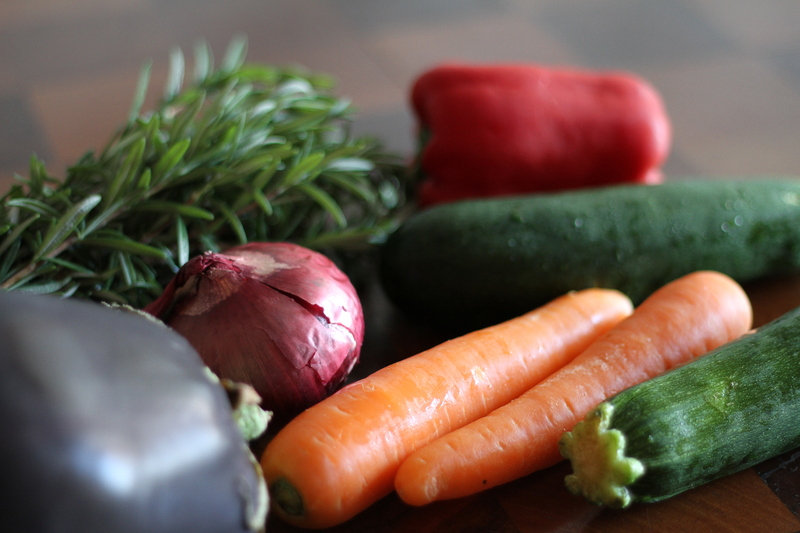 Place all vegetables into a large bowl. Using a zester, remove strips of zest from the lemon and add to the bowl along with 1-2 tsp of rosemary leaves that have been removed from the stems. Pour over several Tbsp of olive oil, a healthy sprinkle of salt and freshly ground black pepper. Toss the vegetables with your hands until they are lightly slicked with oil. Tumble onto a baking tray, lined with paper if you wish, and roast until the vegetables begin to brown a little, about 20-30 minutes. While the vegetables are cooking, prepare the quinoa. One of quinoa’s curiosities is that the seeds are coated with a natural chemical called saponin that prevents the seeds sprouting until they come into contact with water. The saponin has a bitter taste, and it is therefore best to wash quinoa thoroughly before you cook it. The easiest way to do this is to place the quinoa into a fine sieve and run water through the grains for several minutes. To save water, I usually place the sieve over a bowl filled with water and let the quinoa soak for a few minutes before doing a final rinse. Cook the quinoa using your preferred method. Lately I simply microwave it, placing the quinoa, along with twice its volume of water and a pinch of salt, in a large glass bowl. Cover the bowl with plastic wrap, then microwave on high for ten minutes. Remove from the microwave and leave to sit for 5 minutes. The quinoa will absorb any remaining water. 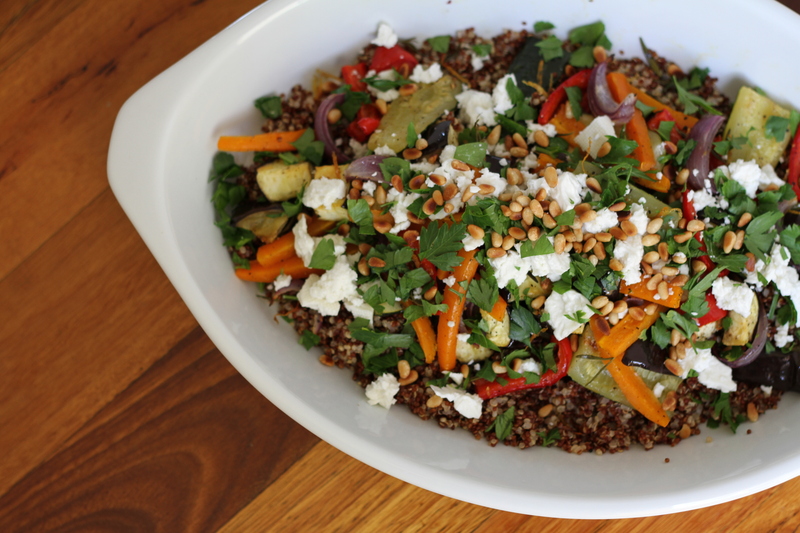 To assemble the salad, tip the quinoa into a large serving bowl and spread the roasted vegetables over the top. 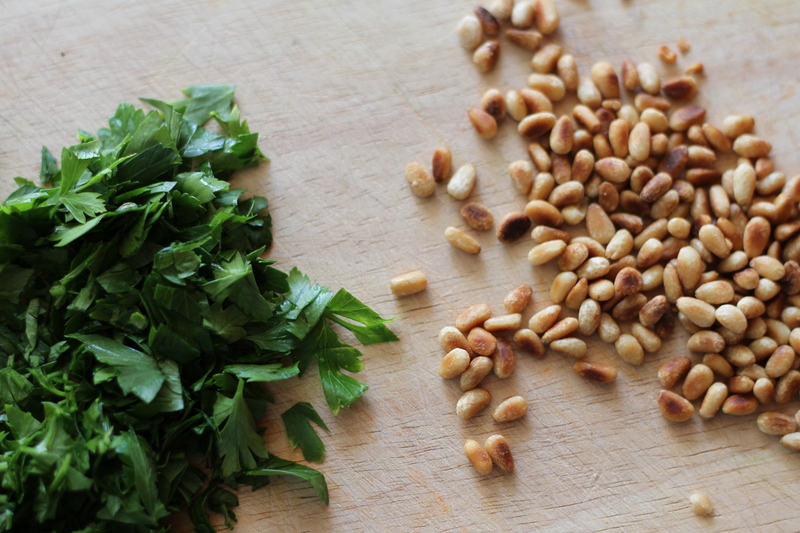 Crumble over the feta, scatter the parsley and pine nuts, and finish with a final grind of black pepper. Hi Nella, that is a good idea. I suppose that it would taste quite different too, depending on whether you used vegetable stock or chicken etc.I used to cook rice in water sometimes – don’t know why I haven’t thought of that for quinoa. I really enjoy your blog layout and the photography s perfect, bravo! This looked too good to miss, so I made it tonight and my wife was impressed. Thank you. What a great introduction to Chez Moi this post has been! I love Quinoa and am always on the lookout for easy recipes to use it in… Am a lacto-ovo pescaterian, too so this salad sounds right up my alley… The Quinoa Patties sound interesting, too (there goes another thing to check out). Cheers (& thanks for dropping by Lifestyle Counter)!